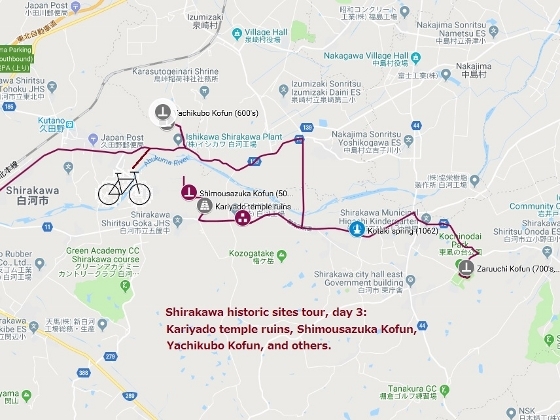 Today I headed towards eastern part of Shirakawa mainly along the Abukuma River and visited ancient kofuns (tumuli or burial mounds) and demolished temple ruins. 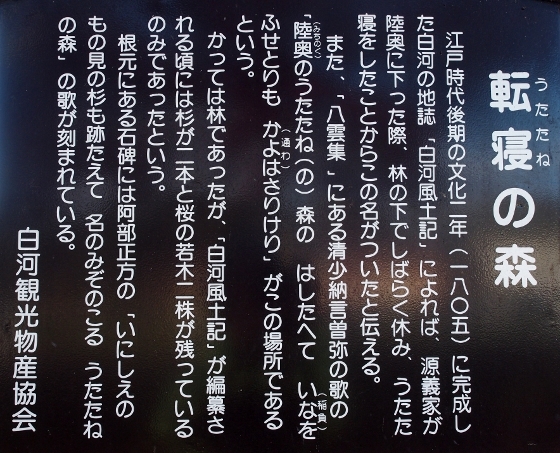 Photos above show the largest kofun I visited today called Shimousazuka Kofun built in late 500’s. 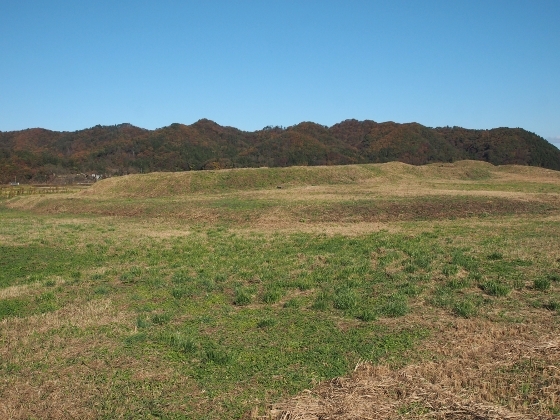 Large mound area spreading on a field in front was the kofun site which was 71.8m long keyhole shape type. 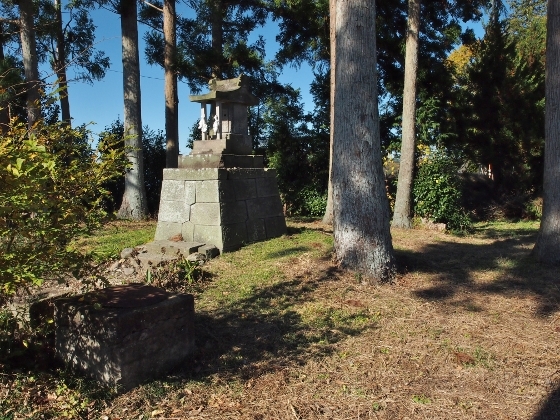 It was considered that local powerful clan at Shirakawa at the time was buried in here. 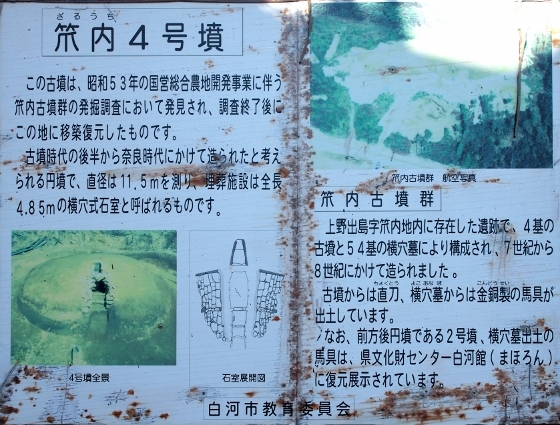 Most of the surrounding areas were now rice fields. 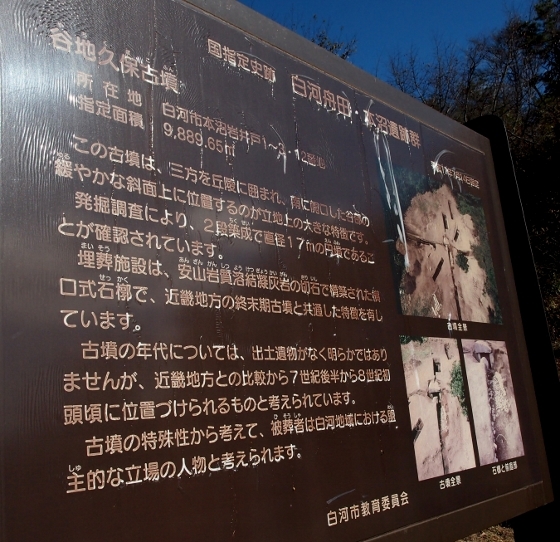 Very close to this kofun site, ancient demolished temple site was excavated which was called Kariyado temple ruins. At the site shown above there were only some remains of foundations left but many artifacts were already taken out and preserved in museums. 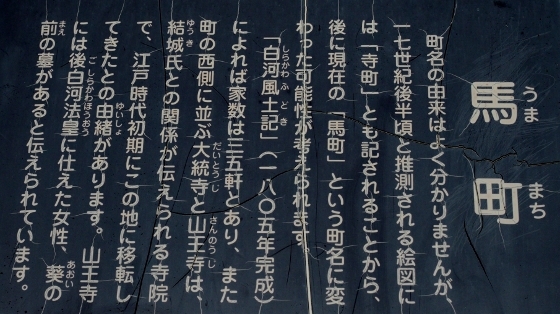 The temple existed between 700’s and 900’s. Earlier in the morning on the way toward east, I visited some more different types of kofuns. 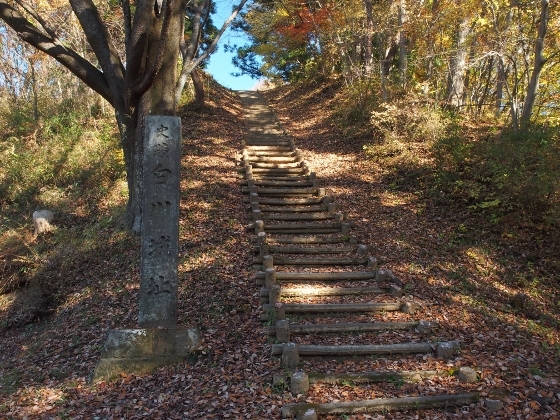 One of them was shown above named Yachikubo Kofun estimated to be built in late 600’s. A part of the stone structure was revealed on the surface but the whole shape was round type of 17m diameter. 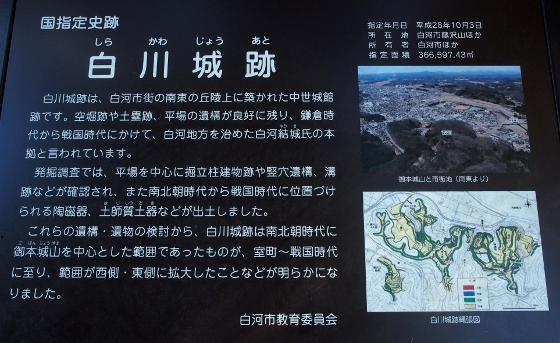 Another kofun site was Nojikubo site located very close to the Yachikubo site. 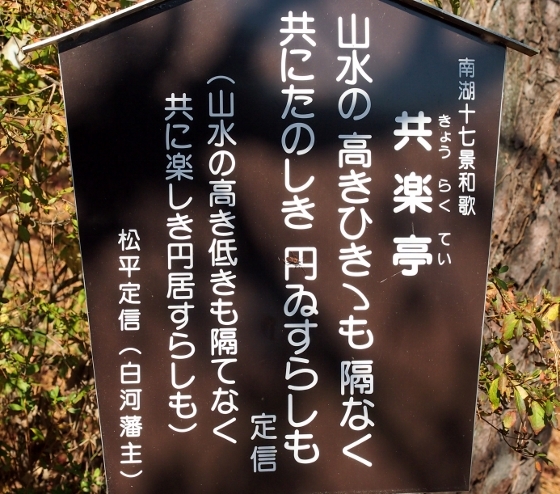 The actual kofun was hiding underground and I could only see the location site in a wood as shown above. 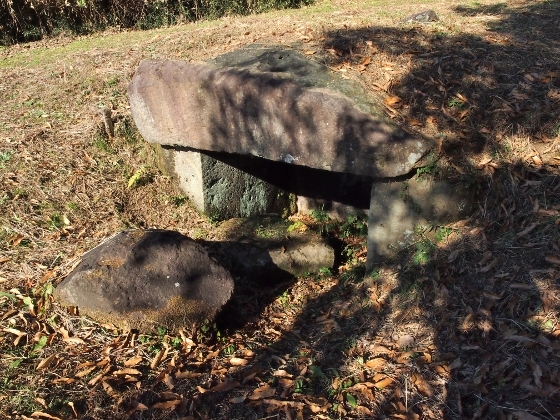 The type of this kofun, which was round at the top and square at the bottom, was a rare type across Japan. 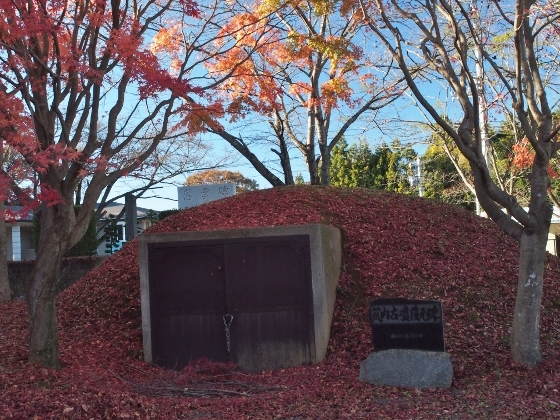 The time of this kofun was considered to be the late 600’s which was the same as Yachikubo. 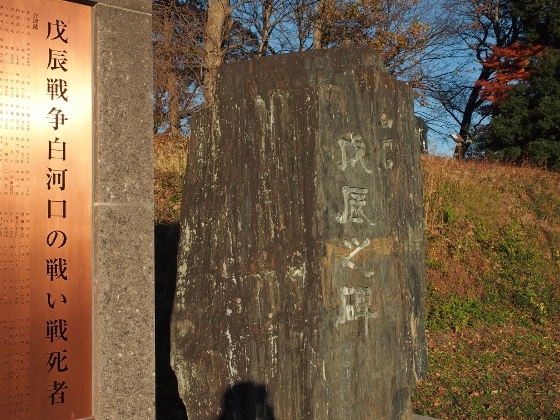 The last kofun site I visited today was Zaruuchi Kofun now moved and restored on the ground of Kochinodai Park located close to the original site. It looked as shown above. 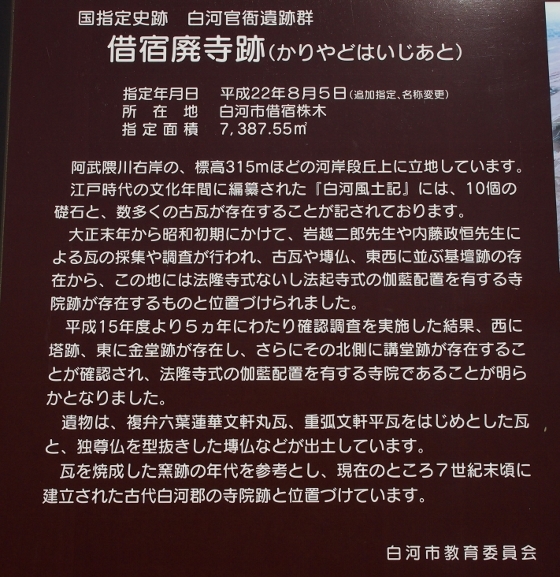 It was a round kofun of a diameter of 11.5m estimated to be built in 600’s. Some other historic sites I stopped at today are shown below. 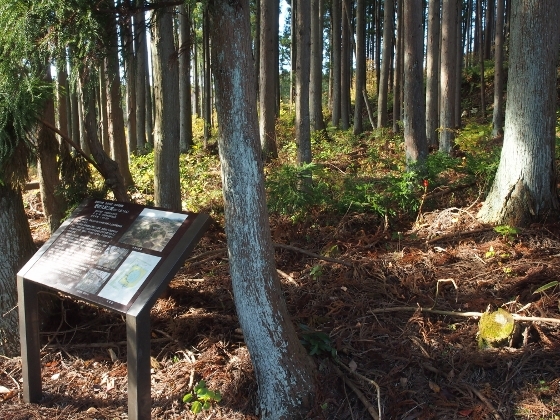 Photo above shows Utatanenomori site where a powerful general Minamoto-no-Yoshiie (1039-1106) was said to have taken a nap here. 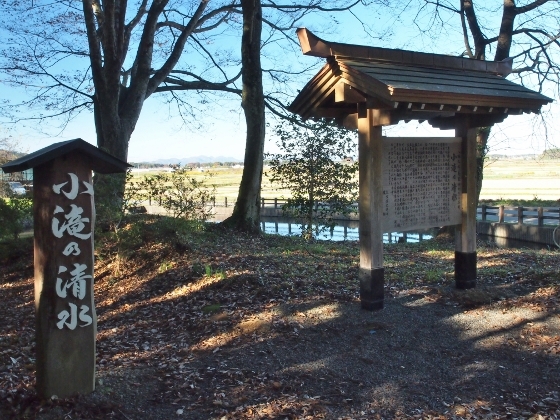 Photo above shows Otaki Spring where the general Minamoto-no-Yoshiie loved during “Zenkunennoeki” battle in Tohoku (1051-1062). Photo above shows foot of Mt. 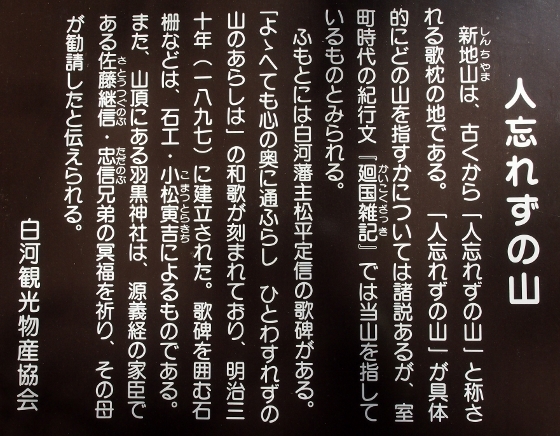 Shinchi which had a nickname “Hitowasurezu-no-yama”. 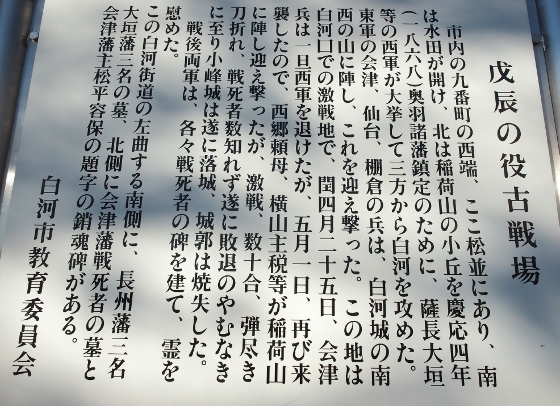 This word frequently appeared in Japanese Waka poem in the old days. 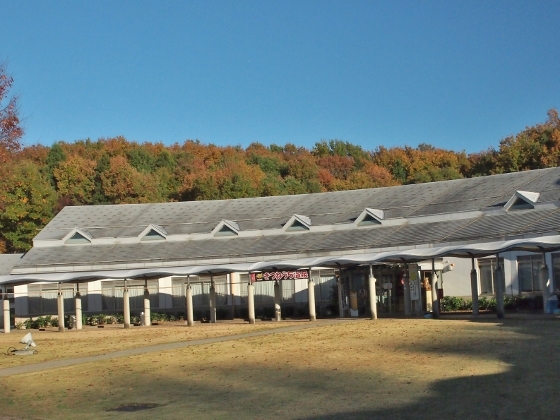 Finally I stayed overnight at Kitsuneuchi hot spring inn as shown above located in the easternmost part of Shirakawa. 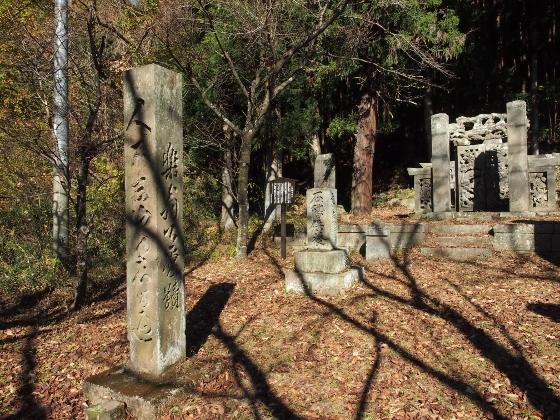 Today was the second day and I first stopped at well preserved graveyard of the first lord of Shirakawa domain Niwa Nagashige in Edo Period. 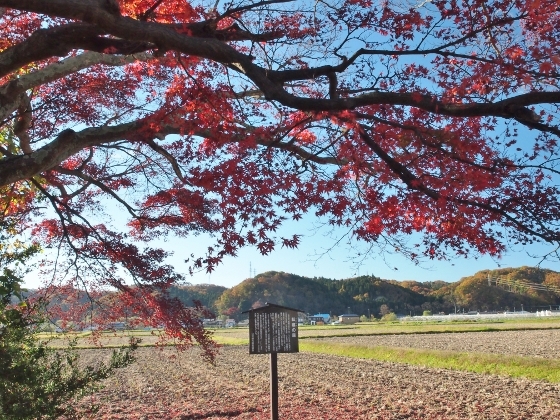 Photo above was a small pond called “Shonanko” located at the entrance point for the graveyard. 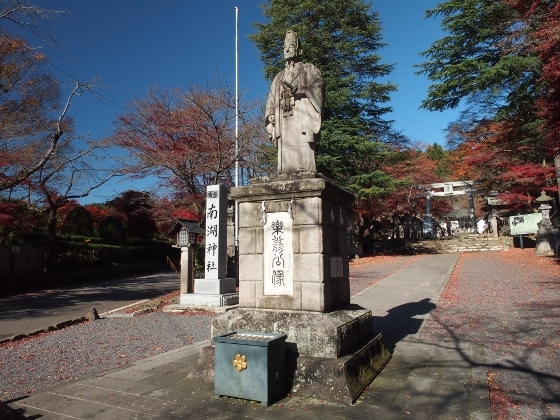 Walking up for a while I came to a mausoleum of the lord Niwa Nagashige (1571-1637) as shown above. 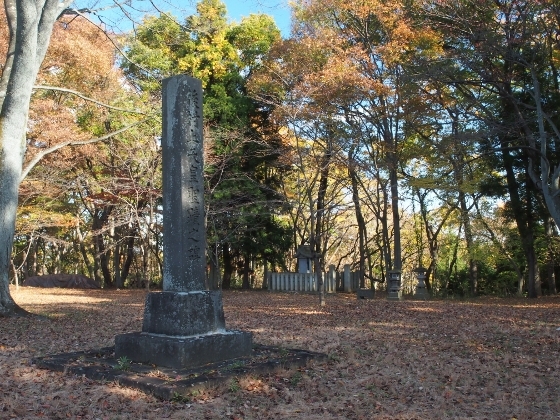 In the same graveyard there were tombs for other lords who served for Shirakawa domain. 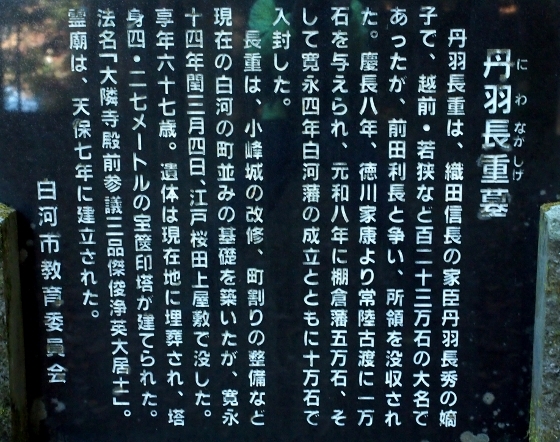 A brief description board on site, as shown above, explained it. 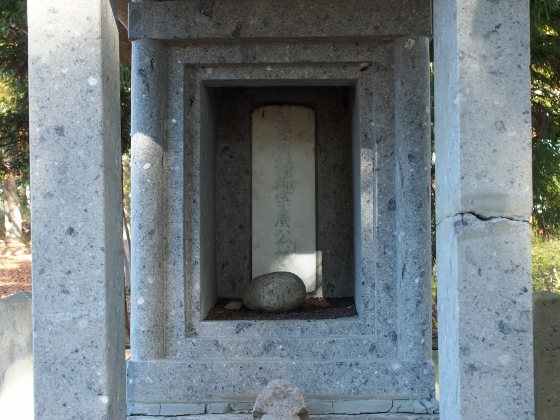 There was also a tomb, as shown above, for 23 Nihonmatsu domain soldiers who died in Boshin Civil War in 1868. Why? 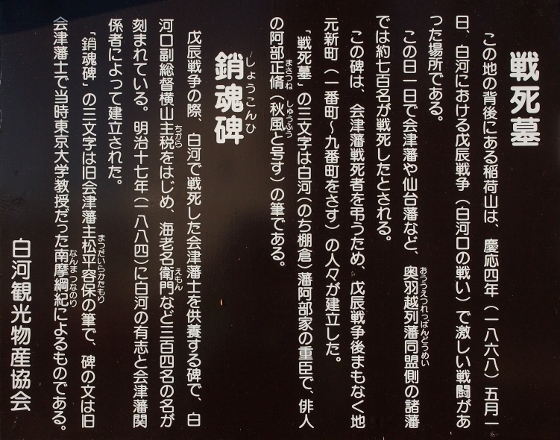 Because Niwa lord family later moved to Nihonmatsu domain. 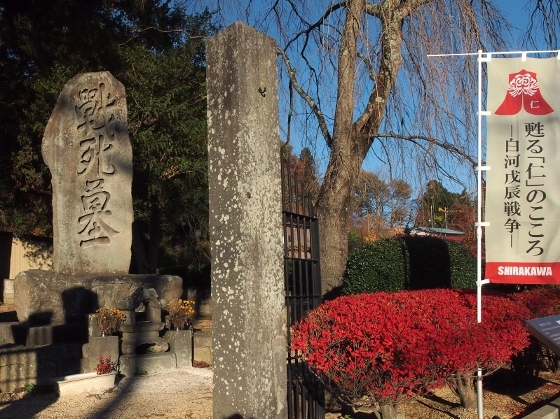 Near the graveyard, there was a historic Daitoji Temple shown above in Umamachi area. 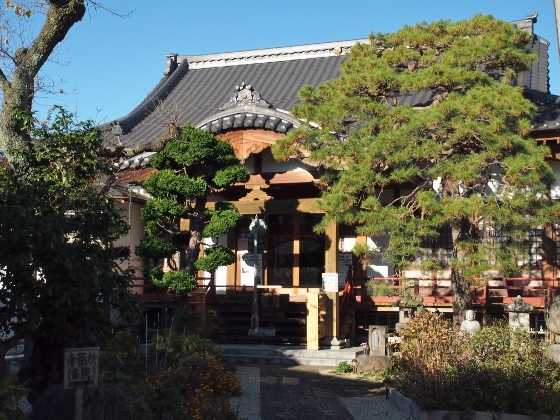 The Buddhist temple was originally found in early 800’s at a separate place but later the lord Niwa Nagashige moved to the current place. Climbing up the steps the top ground looked as shown above. 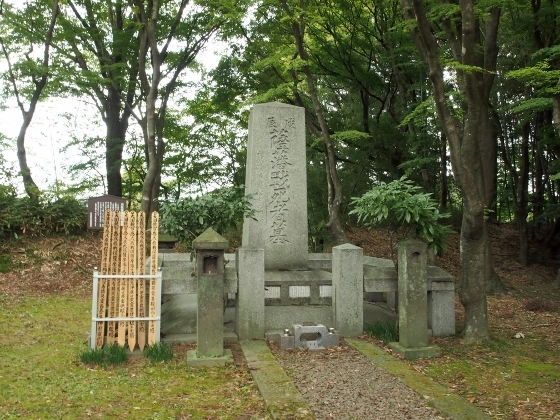 Only a small shrine and a monument were there. 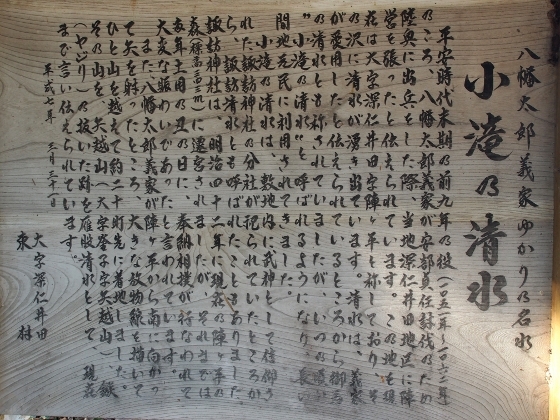 Looking into the small shrine I found the name of the founder Yuki Munehiro as shown above. 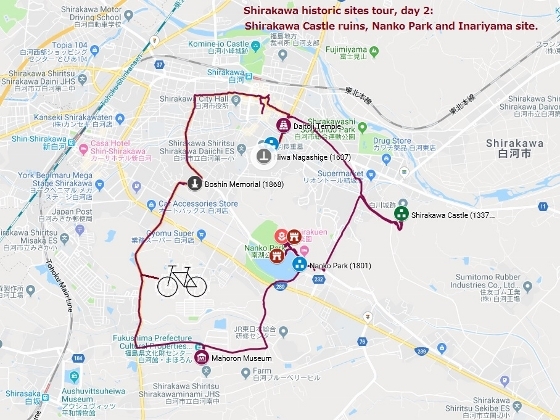 Leaving Shirakawa Castle site I headed to Nanko Park completed in 1801 by Shirakawa domain lord Matsudaira Sadanobu, which was designated as national historic site as well as national scenic site. 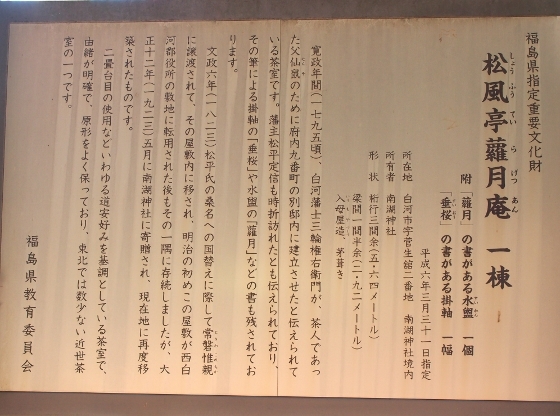 This was the first official park in Japan and the entrance of the park looked as shown above. 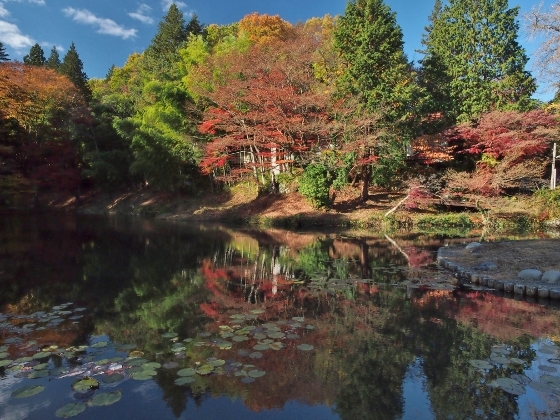 A Japanese style garden “Suirakuen” made later was located adjacent to Lake Nanko. 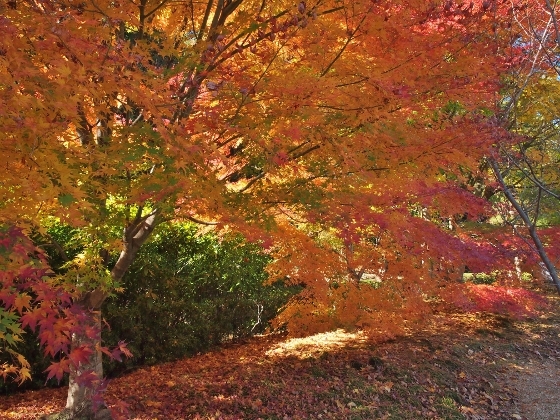 The late autumn foliage looked as shown above. 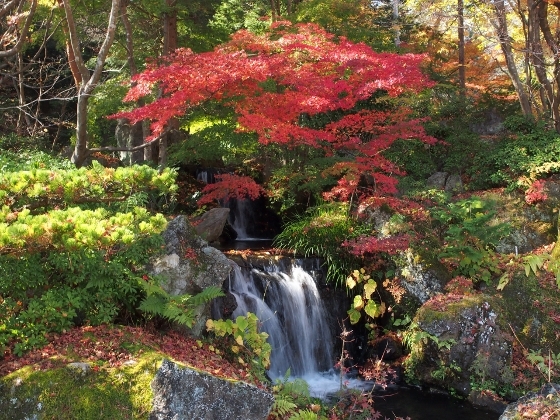 Right next to this garden there was Nanko Shrine where Shirakawa domain lord Matsudaira Sadanobu who developed Nanko Park was enshrined. 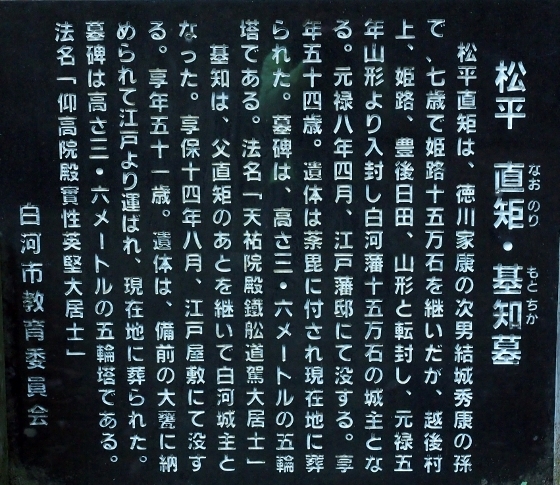 There was a statue of the lord at the entrance of the shrine as shown above. 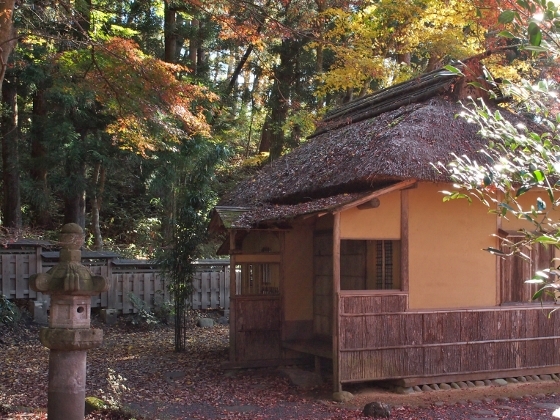 A historic teahouse building “Shofutei-ragetsuan” which was built in 1795 was located within the precinct. 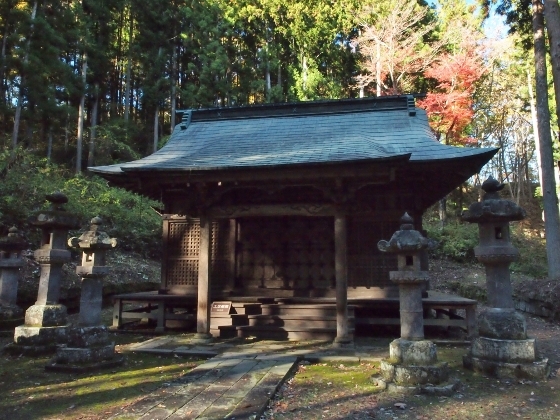 The teahouse was originally built in separate place and loved by the lord, but later moved to the current site. 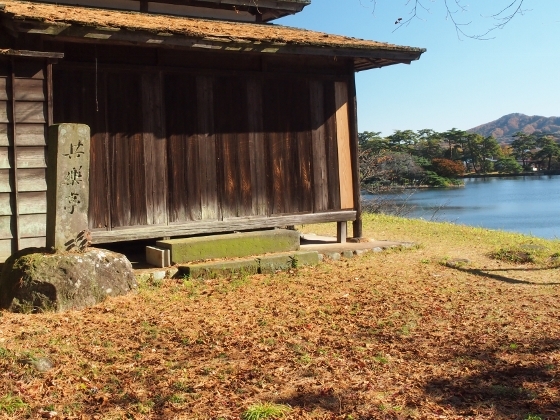 Another historic teahouse called “Kyorakutei” was located on a small hill on the edge of Lake Nanko as shown above. 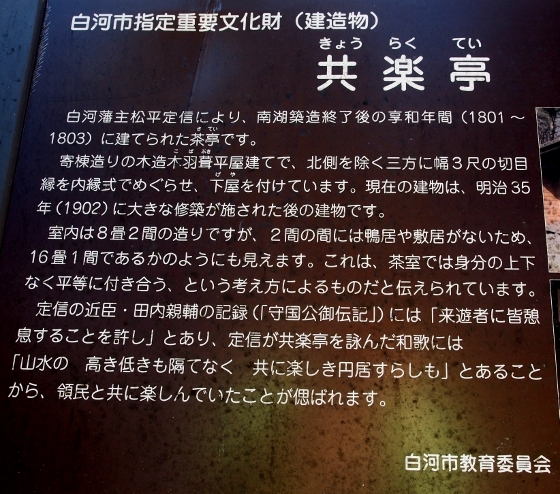 It was built between 1801 and 1803 after the development of Nanko Park was finished. The name symbolized the basic idea of the lord that everyone should enjoy their life regardless of rank, position or class. 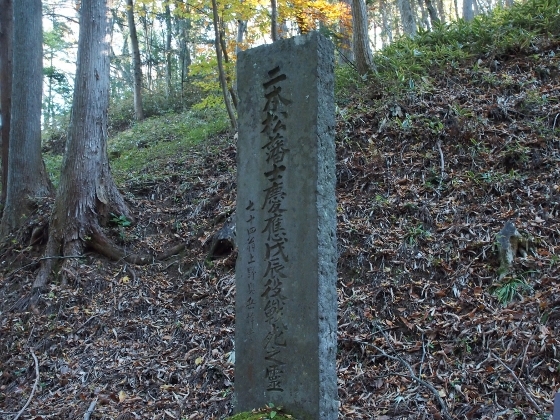 Near Kyorakutei there was a tomb for Tanagura domain soldiers who fought and died in Boshin Civil War in Shirakawa battlefield. 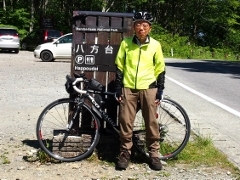 Leaving Nanko Park I headed to Inariyama site where Shirakawaguchi battle, which was the fiercest Boshin fight in Shirakawa between Tohoku region allied forces and the new government forces. 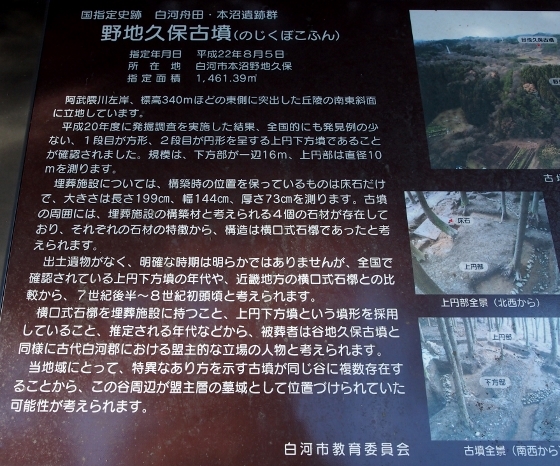 Photo above was a grave for Aizu domain soldiers who died in the Shirakawaguchi battle. 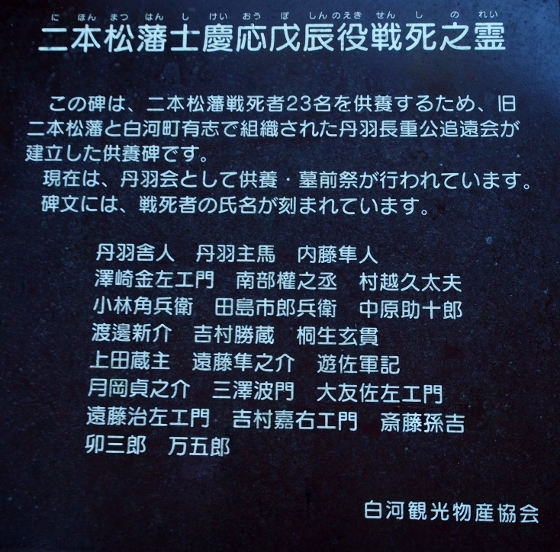 There was another memorial monument shown above for all the victims of Boshin Shirakawaguchi battle. 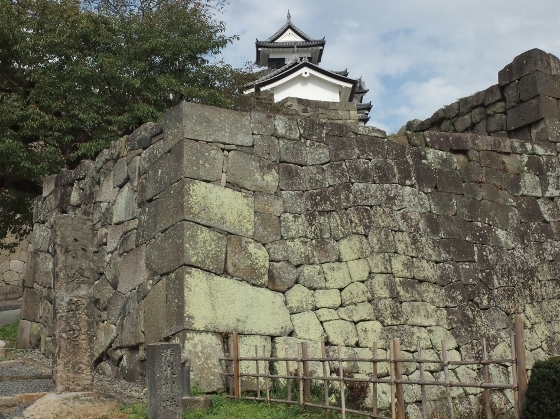 Stone walls of Kominejo Castle site in Shirakawa were heavily damaged by the Great East Japan Earthquake in 2011. 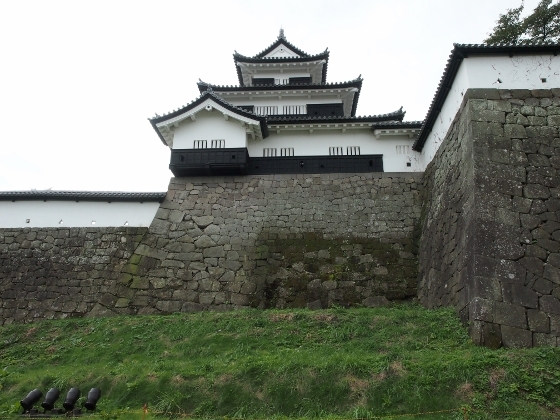 Restoration work began after the disaster and it took more than 7 years to fix the majority of the walls. 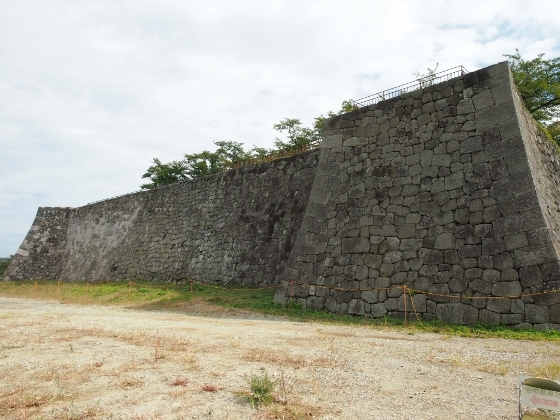 Today the repaired walls were opened to the public for only a single day and photo above shows the repaired western stone wall protecting the Honmaru or the central area of the castle. 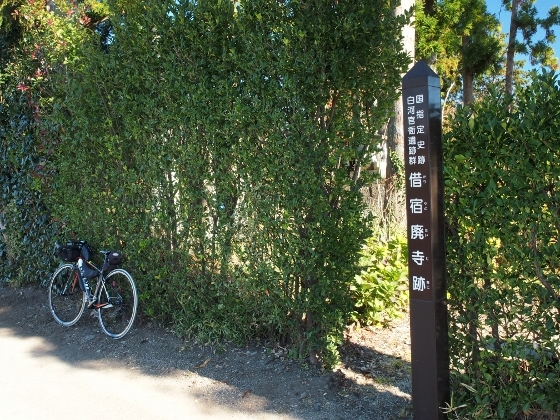 The location of the castle was right next (north side) to JR Shirakawa Station. 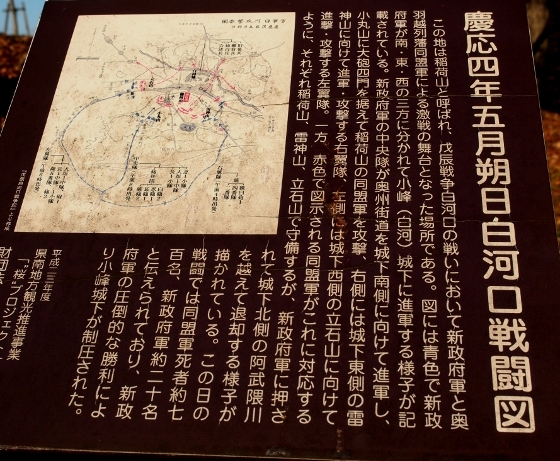 Photo above was a map of the castle area posted at the site showing the repaired portion of the stone walls in red and blue. 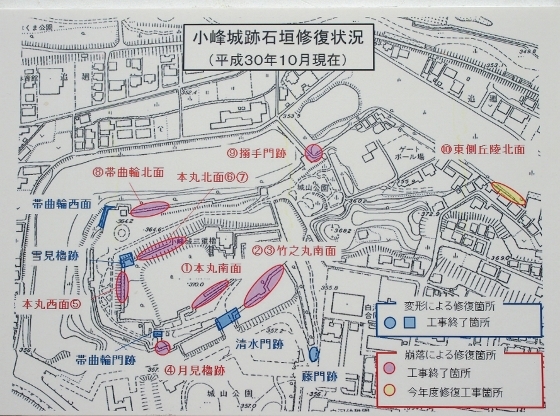 Restoration work was completed for the major parts except for the yellow part in the east. All the work is scheduled to be finished in the next few years when all the area will be open to the general public. Photo above shows the northern side of the wall which is the longest. White colored stones show the repaired part of the collapse. 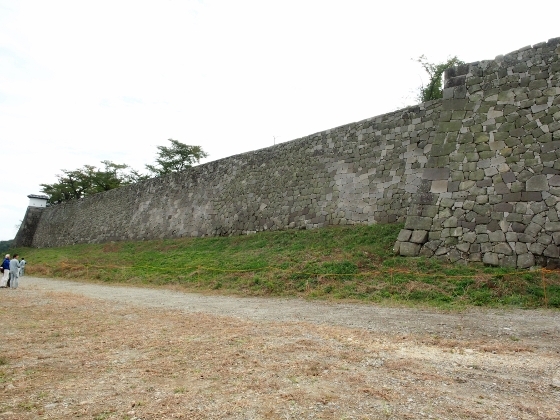 Photo above shows stone wall at the back side (northern side) of 3-story Yagura or turret building. 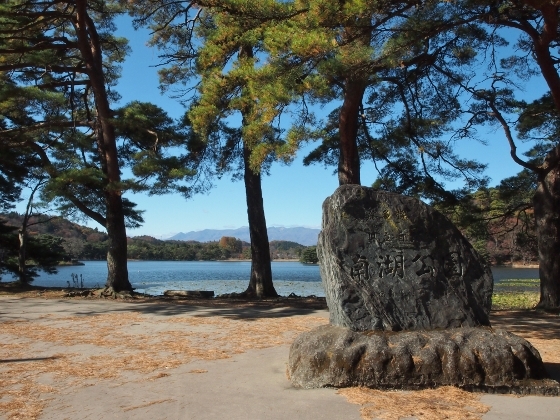 This stone wall was one of the oldest ones built even before the large-scale reconstruction work between 1629 and 1632 lead by the load Niwa Nagashige. 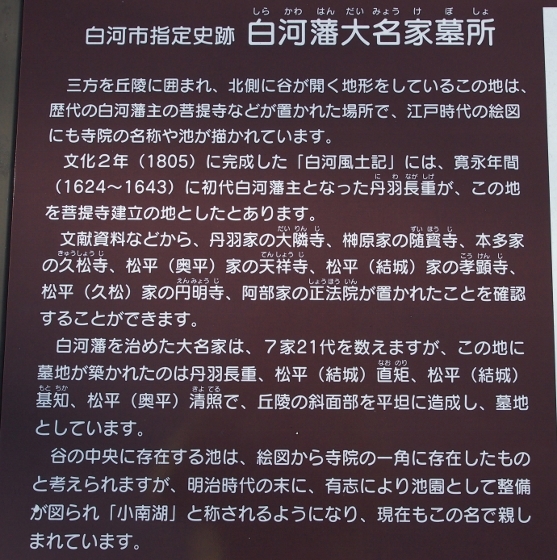 Right next to the east side of the castle area there was a large tomb for some of the new government force solders from Satsuma domain who died in the Boshin civil war battle in Shirakawa as shown above. 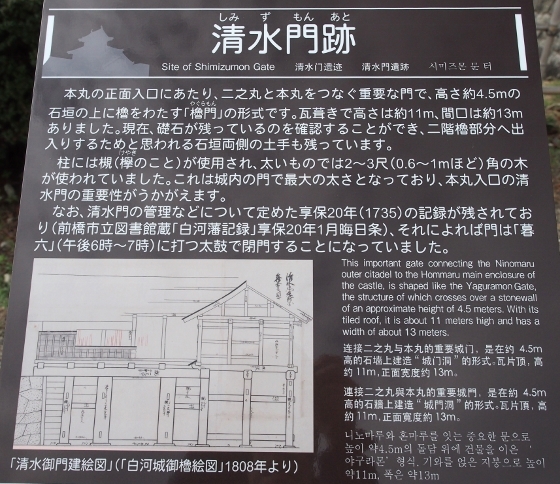 Photos above show Shimizumon gate site (left hand side) which was the most important gate for the castle and which was located just in front of the main 3-story Yagura building. 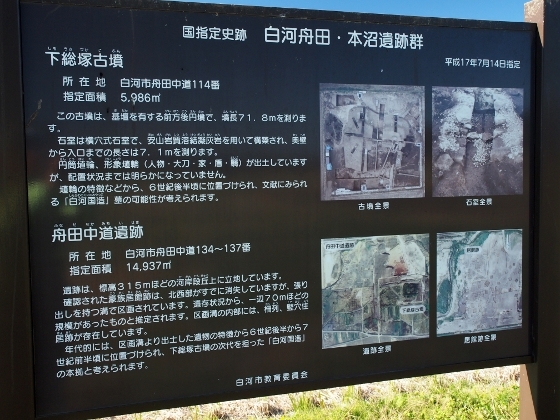 A brief description panel stood at the site.